When I signed books at the King's English in Salt Lake City, parents from a homeschool group told me that they had a science fair coming up, and that their children were excited to try candy experiments for it. Their excitement reminded me that, since it's science fair time, lots of families are looking for science fair ideas. 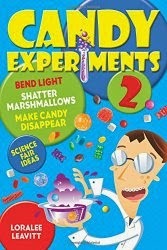 Here are some ideas for elementary school candy experiment science projects based on experiments from my website and from my new book. Enjoy, and let me know if you have ideas of your own--with 70 candy experiments in my new book, the possibilities are endless! For each experiment, think of a question to answer, then do your own research to see what answers you get. Remember to control the variables in your experiment: for instance, if you try chromatography in different liquids, don't change anything else like the size of the filter paper or the temperature of the liquid. Some project guidelines might ask you to form a hypothesis at the beginning of your project, meaning a prediction as to how it will turn out. Life Savers flash when you crush them because they contain sugar and wintergreen oil. Can you find other candies that make flashes of light? Which work the best? What crushing method makes the best sparks for the Life Savers experiment? Chewing, crushing with pliers, smashing in a mortar and pestle, or something else? As popularized by Steve Spangler, dropping Mentos into a bottle of Diet Coke produces a sky-high fountain of soda. But why? Invite your at-home scientist to investigate which kind of candy makes the best soda fountain and why. First, examine each kind of candy and compare differences. Then drop each sample into a cup of Diet Coke and compare the bubbles. Children should soon be able to see that the surface of the candy makes a big difference in the amount of bubbles you get. Test different kinds of soda to see which works best for the experiment. Have your children formulate a hypothesis about which soda will fountain the highest, then drop the same number of Mentos in each to test the hypothesis. Which sodas work the best? What ingredients do they have in common? Sour candy contains acid. Which kind of candy is the most acidic? Make sure that you use the same method testing for all the candies: each sample should be dissolved in the same amount of water, such as 1/4 cup; the water should all be the same temperature (preferably warm); each sample should be tested after a set amount of time or allowed to dissolve completely.. If you use baking soda to see how much acid is in each candy, you'll have to use the same amount of baking soda for each test (1/4 tsp or less), and have a good way to measure which reaction is the biggest (you may want to video each test so you can compare the results again later). Ph test strips would be a more accurate way to measure the acidity. To see how two dentists tested candy acidity, check out this article from the UAB School of Dentistry. Candy colors are formed by a mixture of dyes. So are the colors in many other things, including ballpoint pens and markers. Which kind of candy has the most dyes mixed together? If you test candies and markers that are the same color, do you get the same color separation? Do you get different results if you stand the chromatography paper in different liquids, such as salt water or alcohol? -Science Buddies project guide This website also has ideas and instructions for a variety of projects. Bree, I'm really interested in the Growing Gummies project too. If you do it, let me know!